Well it is good to be back after quite an absence. If you are wondering what I am back to, pop over to Julia's blog and read all about it. You will be pleased to hear that this is a short post today as I have spent the morning at the eye hospital and have had so many drops in my eyes that I can't focus on anything. (I am going back at the end of April for lazer treatment so I am hoping for an improvement in my eyesight after that). Secondly I have very little to show. I have just about got rid of the flu that visited me over Christmas, but haven't felt up to doing much more than the date-sensitive card-making needed so far this year. So on my desk is the pile of cards I took down along with all my other decorations, after the Three Kings Fiesta in our village for Epiphany. 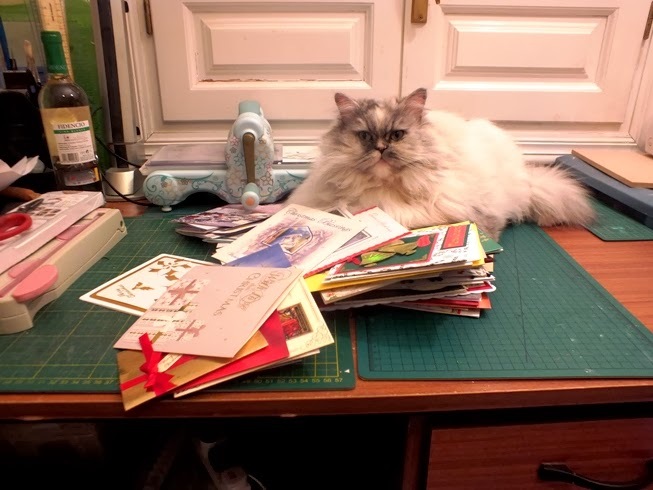 Arwen is helping me to sort them out into piles - ones to 'salvage' bits from for reuse, some that will inspire me to CASE them later, and a few that will go to my friend who recycles them into new cards to sell for church funds next Christmas. And that's about it for this time. Having seen horrific scenes of floods, angry seas, and ice plains on TV, I feel almost guilty to say we are enjoying beautiful sunny days, but right now it is too bright for me outside, so I will have stay in and finish sorting my cards for now. Stay safe everyone. So very sorry to hear about your son's house sale Kate...as you say it will happen but it's such a traumatic time for all...sending big hugs to all. wow how good will that be if they can improve your eyes following treatment, I hope everything goes really well and that you will keep us posted of your progress. Hope your eye treatment has helped and that things continue to improve. Bright light affects my hubby's eyes after he has his retinopathy so he sympathises. Good to see that you have plans for your cards..I am going to cut out tags from mine for next year! Hope the eye surgery does help, and when you can do please send us even a teensy bit of sunshine. I have a friend who had lazer surgery and she no longer needs glasses. Her eyesight is 20/20, so I hope the same for you in April. I would never consider deconstructing cards that someone made me, so I applaud you. Oh Kate - hope your eyes are clearing now - DH has those sorts of drops quite regularly :-(. Love the way Arwen is taking the job so seriously :-). I'm glad you are over the flu! I'm sure the eye surgery will go without a hitch. My dad had cataract surgery and he's so glad that he did. Although the eye drops were an annoyance. That's a big stack of Christmas cards received. Your helper looks quite proud! Thank you for visiting me already. I'm trying to get some visiting in every day. I hope the eye treatments help. My grandie had a cataract removed and claims that it is like magic! May yours be like magic too. Happy WOYWW! My mum had both eyes lazered twice, she has glaucoma and it seems to be ok now. I hope your's goes well. It is very cold tonight in the UK, Spain sounds appealing!